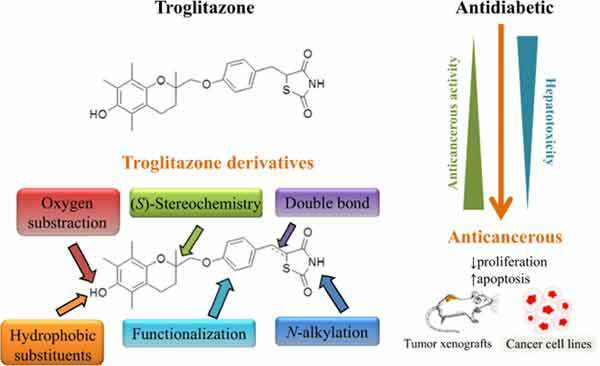 Reprofiling of Troglitazone Towards More Active and Less Toxic Derivatives: A New Hope for Cancer Treatment? The existence of unresponsive tumors and the appearance of resistant tumors during the course of treatments both justify that we increase urgently the panel of pharmacological molecules able to fight cancer. An interesting strategy is drug reprofiling (also known as drug repositioning, drug repurposing or drug retasking) that consists of identifying and developing new uses for existing drugs. This review illustrates drug reprofiling with troglitazone (TGZ), a synthetic PPARγ agonist initially used for the treatment of type II diabetes. The fact that TGZ also displays anticancer effects is known since the end of the nineties but its development as an anticancer agent was slowed down due to hepatotoxic side effects. Part of the knowledge available for TGZ, mainly the molecular basis for PPARγ activation, its metabolization pathways and the side effects on hepatocytes, were taken into account to elaborate new molecules. Key findings were that unsaturated TGZ derivatives, when compared to TGZ, do not activate PPARγ, exhibit a higher efficiency on cancer cells and a lower toxicity towards hepatocytes. However, a weakness is that the mechanisms involved in the anticancer effects are still not completely understood and that the efficiency of such derivatives has not yet been completely studied in vivo. Data about this point should become available very soon from animal models and this will be a prerequisite to initiate clinical trials with these potential new anticancer drugs developed from a drug repurposing strategy. Drug reprofiling, Troglitazone, Thiazolidinedione, Cancer, Diabetes, Hepatotoxicity. CRAN, UMR 7039, Faculté des Sciences et Technologies, BP 70239, 54506 Vandoeuvre-lès-Nancy; Cedex France.